The excessiveness of globalized economy, hordes of giant container ships, flows of raw materials, goods and large scale services, its « historical » impact on the environment and side effects on health and labour, starts hitting our consciousness. Europe is probably the most advanced continent in terms of social and environmental protection so far. Though it’s far from being a unique paradigm for the rest of the world, Europe has been the place for a few hopeful concepts. In Norway, european champion for a long term vision, the Brundtland report (« Our common future ») raised both economical, social and environnemental ambitions in 1987. Earlier, the Club of Rome rang the alarm bell as soon as 1972 with its famous « Limits of groth » manifesto. So famously unfollowed and neglected by most worldwide economic and political leaders. Deep into adolescent denial, addicted to freedom! And the european people, as a whole, admitted this negationist policy. 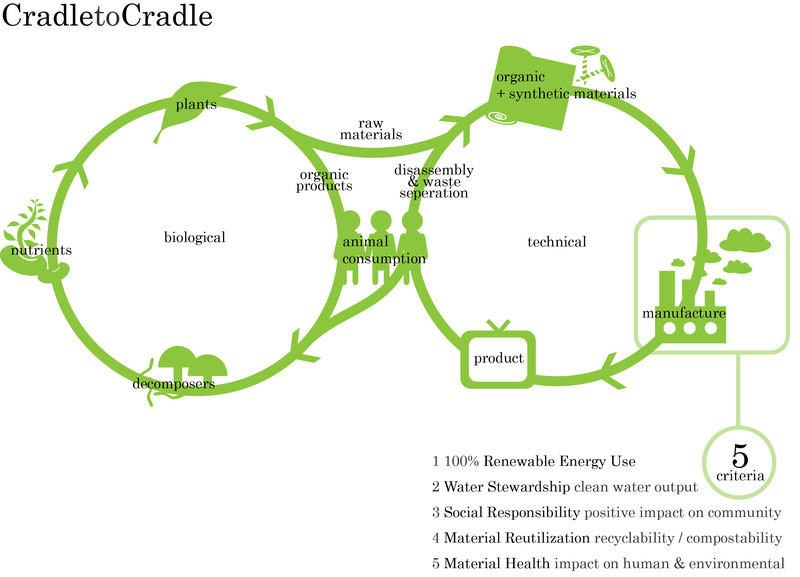 A vast project, circular economy (« cradle to cradle ») was first designed by Michael Braungart and William Mac Donough in 2002. Unlike « linear » one (as a conveyor belt, from raw material to end product, ending up its life in a dump), circular economy is meant to be more sustainable and responsible! As a sign of times, Mc Kinsey strategists recently underlined all the potential of this new paradigm and its impact on world manufacturing organization. Towards the end of world factories in South East Asia, of immoderate carbone footprints, and miserable offshoring? As we seem to rediscover reshoring and the power of « local », circular utopia is « in ». In a world that eventually turns in circles as well as our favorite index, GDP, formally outdated and intellectually toxic, a woman promotes this new economic vision. This is Ellen Mac Arthur. Self-willed and generous, she wishes to inspire a rethought world and a positive future. As Nicolas Hulot and his diplomatic mission, the former yachtswoman aims at general public and the economic world. France, not to be left apart, just set up the Institut de l’Economie Circulaire. As usual, in order to get a widespread move, each stakeholder should feel concerned and responsible. There will be winners (such as collecting and recycling businesses) and losers (mining companies, shipping companies, impatient speculators). But general interest, formerly misinterpreted after Adam Smith invisible hand concept, will develop! After all, circular economy is just a matter of common sense, the one our countryside ancestors used everyday. The one lost by modernity and urbanity, often disconnected to reality. If circular economy works, we’ll see again that economy and ecology are compatible. What if this was the way to grow up, from adolescent to adult condition? No doubt our children and grand-children will be pleased to see this!! ← Bienvenue à l’économie circulaire !